In the first season of Magical Princess Minky Momo (1982), Momo dies in Episode 46 when she's hit by a truck, twelve episodes before the actual end of the series. I did intend to spoil the series without actually warning you, but this bizarre twist of fate in a "magical-girl" series is not only well-known by elder otaku out there, but it is a notorious example of the genre embracing darker emotions. Yes, the likes of Pretty Cure and Tokyo Myu Myu did deal with forces of evil and darkness, but it has been a while since a magical-girl show has brought a sincerely dim and apocalyptic point-of-view, let alone even deal with death. The last vivid example off the top of my head may be the deaths of Sailor Senshi in the Sailor Moon shows, but much like Minky Momo the dead were merely revived in future episodes. This softening and shifting of the "magical-girl" genre in recent years may have been a reason I wasn't convinced by the announcement of Puella Magi Madoka Magica as being anything different. Not to shoot down the industry, but it feels like the "magical-girl" trope has been embraced less by its actual target audience—young girls—and more by the adult fans. Call me an old codger when it comes to these sorts of shows, but I sense the genre has lost its way in trying to appeal to everyone. The announcement of Madoka Magica was also surprising in two different senses. First of all, the show would be accompanied by manga instead of based off of one, meaning that the production crew would be providing an untested story for the public. Second of all, the show would be chiefly produced by Akiyuki Shinbô, who has produced many of his cleverly-animated shows with SHAFT, the animation studio in charge. 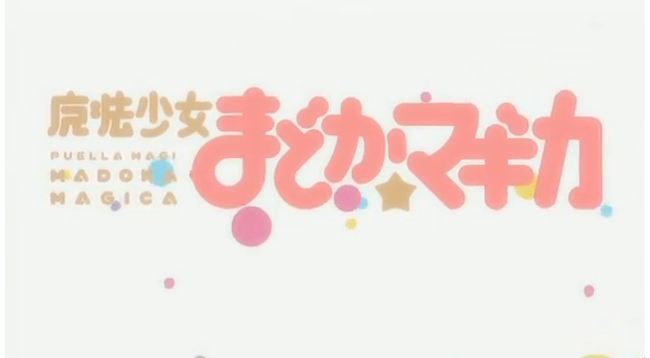 This was surprising more from the fact that Shinbô produced the first Magical Girl Lyrical Nanoha series, which has been one of those shows that seems to have a distinctly adult following. 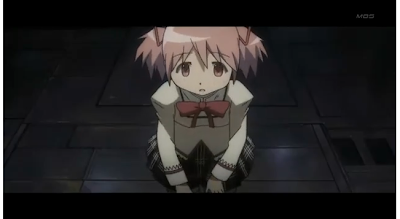 Madoka Magica actually starts in a rather disturbing fashion with the main character, middle-school student Madoka Kaname, waking up from a dreary nightmare where she witnessed a dark-haired magical girl fighting off an unidentified force of darkness. 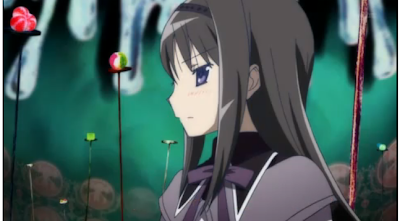 Dismissing it as a bad dream, Madoka is startled to find that same girl, Homura Akemi, transferred to her class, and the uneasiness doubles when Homura vaguely warns Madoka about the future. It isn't until Madoka and her friend Sayaka rescue a small white creature called Kyubey (whose unmoving mouth and vacant eyes will disturb me in my own dreams) that we realize that Homura's warning was not to be taken lightly. During a struggle to defend Kyubey from Homura herself, Madoka and Sayaka suddenly find themselves trapped in a dimensional void full of butterfly-winged monsters and shapeless witches. Their own rescuer, Mami Tomoe, is a capable magical girl who can defeat these ghouls with oversized Flintlock rifles, and Madoka and Sayaka are presented with their own opportunity to become magical girls like Homura and Mami, as long as they have a wish they would like granted first. There is no doubt that Shinbô and SHAFT have done this sort of presentation before, as their trademarks are splashed all over the show. 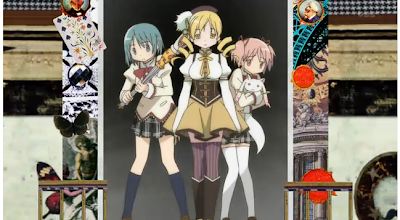 The architectural styles of Madoka's school and home are as angular and monochrome as those in Bakemonogatari, while the characters themselves, complete with pastel hair colors and boxy faces, are patterned after character designs from Ume Aoki, the mangaka for Hidamari Sketch (another SHAFT-spun anime). There's not that much to that seems to scream individuality from the story itself, as the "nightmare-scenario" depiction of the future has the traits of a Sailor Moon S episode. Seems like it's all been done before, eh? However, when Mami leads Madoka and Sayaka on witch hunts to seek out "Grief Seeds", Shinbô is finally able to open a Pandora's box of surrealism that he likely didn't have the freedom to explore in Magical Girl Lyrical Nanoha. If you have ever seen the opening sequences to the Zan: Sayonara Zetsubô-Sensei series, you've come across Shinbô's use of two-dimensional paper collages to shock the senses. 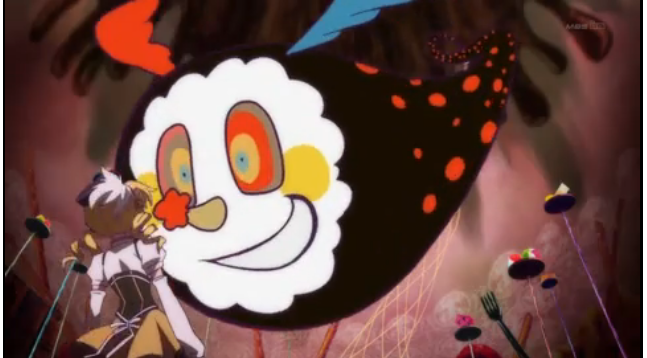 By themselves, the images of random oversized doughnuts, Lego pieces, and puffy dandelions sporting handlebar mustaches seem obtuse and incoherent, but scattered about the fights between magical girls and witches, they become an eclectic wonderland that Alice herself never imagined. Combine these flights of visual fancy with the grandiose musical works of Yuki Kajiura (.hack//SIGN, Tsubasa Chronicle), and you have chaotic perfection. I also remind the viewer that this isn't some cream-puff Magical DoReMi for the kids. This story, despite the characters and faceless villains involved, is darker than first imagined. It's as if Shinbô knew that adults would be drawn to the show like moths to flame and intentionally threw a curveball so wild that it may rival the non-sequitur truck accident that claimed Minky Momo's life. Let's just say that the first lessons taught by Mami to Madoka and Sayaka about witch hunts in Episode 3 end up disastrous. It's this unspoiled disaster that makes the next three episodes so much more fun to anticipate. Puella Magi Madoka Magica could be the one show that saves the winter anime season from uncertainty and "magical-girl" fandom from itself. UPDATE (9:38 PM): An additional link from @kransomwastaken providing an excellent read at Ani no Miyako on the "cut-out style animation" used in some of Shinbô and SHAFT's other shows (Sayonara Zetsubô-sensei, Maria Holic). Thanks! I would whine about you spoiling Minky Momo and Sailor Moon for me, but those have been sitting on my hard drive for 2+ years, so I suppose I can't. But still, there's a vague sense of anger I must register with you. Dammit. That done, I heartily agree with this review. Magica is quickly becoming one of my favorites this season. Where on Earth did you find Minky Momo? Amazon Video doesn't want to take my money because I live in Australia, so I have no idea where to buy/watch it.